No matter how passionate you are about preparing meals, if you spend a lot of time in the kitchen every day, cooking becomes less of a pleasure and more of a chore. 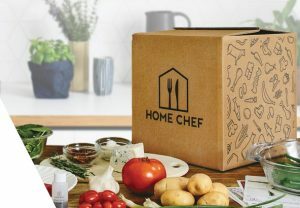 Home Chef is a meal kit delivery service that promises to make cooking fun again. It allows you to cook amazing, good-for-you meals in no more than 30 minutes and discover new, exciting recipes with every order. Here is what you need to know about how it works and what it has to offer. For a detailed overview of its services, check out our full Home Chef review. Home Chef offers hand-picked, chef-curated recipes designed to help you cook healthy meals in no time and introduce greater variety into your diet. Apart from the recipes of your choice, each weekly delivery contains fresh, pre-portioned ingredients necessary to make the meals. Everything is carefully packed to preserve the crispness of the ingredients and delivered straight to your door. Therefore, what you get are great new meal ideas to try out, everything you need to turn those ideas into reality, and maximum convenience with professional chefs and friendly delivery guys doing nearly all the work for you. Ordering from Home Chef is equally simple and convenient. Once you subscribe, you get 18 options to choose from every week. The items at your disposal include meals suitable for lunches and dinners, a delicious smoothie, and a fruit basket. You get to see which item is preferred by Home Chef customers, as well as which item is especially recommended by the staff, so when in doubt, you can go with the top recommendations. If you have a special occasion coming up and want to prepare something that will truly impress your dinner guests, you can go with the Premium meal that costs a bit more but is a lot more luxurious than regular meals. Once you take a good look at the menu, you can decide on the quantity. Home Chef allows you to order 2, 3, 4, 5 or 6 meals per week for 2, 4 or 6 people. If you want to order more servings of a certain meal, you can make use of the Flexible Servings feature and get 2 or 4 additional servings for meals of your choice. You can also take advantage of the Customize It feature and switch, upgrade or double the main protein for select recipes. That means that you can order exactly what you want and have as much food as you please at your disposal, which is not something you get with just any meal delivery. The prices of the dishes are reasonable and with Home Chef coupons and free delivery for orders over $45, you can get a great home-cooked meal at the price of a burger. Home Chef invests great effort into offering you exactly what you love and need. Once you sign up for the service, you get to create your personal taste profile and get weekly recommendations based on your preferences. You can go with the meals especially picked out for you, but you can also browse the full menu and choose anything you wish to enjoy that week. Based on everything said above, we can conclude that Home Chef is a perfectly simple way to shake up your cooking routine and make cooking for yourself and your loved ones easier, quicker, and a lot more satisfying.